The essential bundle for owners of the flagship Motif XF. The Motif XF has the same basic sound engine as the Motif XS and so for the most part, the World Of Motif XS will apply to a Motif XF equally as well. Where the instruments differ, is in how the Motif XF handles sample storage and this is where the Motif XF Fully Loaded program comes in. In this DVD you will learn every twist and turn of how to manage loading and saving your sample data on standard 128MB of sample RAM and the optional Flashboards. Finally, the Motif XF is a powerhouse recording platform, offering not only a ton of incredible recording features internally, but also capable of working alongside DAWs. Music Production On Motif looks at both internal recording on the Motif XF and at how your XF interacts and interfaces with some of the leading DAW platforms including Cubase, Logic, and Studio One. 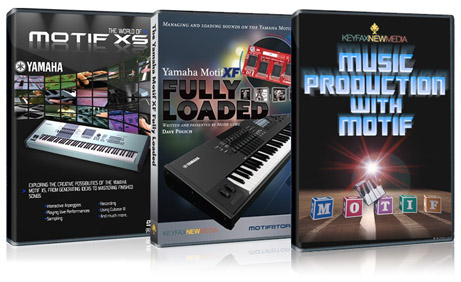 This bundle is essentially a threefer deal, offering a whopping $35 off the regular cost of these three compelling videos that will set you up for working on the Motif XF platform for years to come.